Store unlimited Sketch, PSD, XD, Illustrator, Figma design file versions. Switch between versions and download source files from Avocode. How does versioning in Avocode work? 2. Sync the new version from the design tool. Sketch: Press CMD + ALT + J in Sketch to upload all artboards to Avocode. 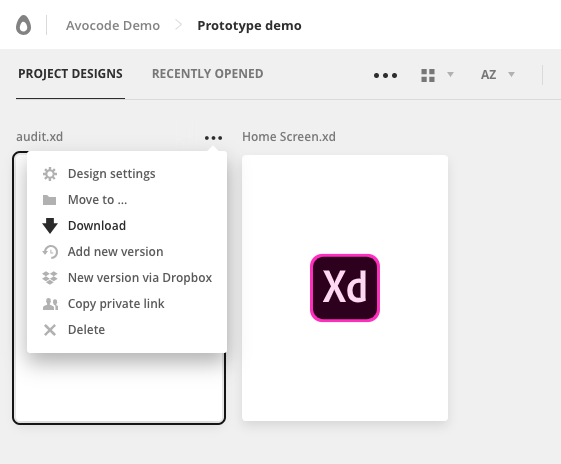 Adobe XD: Press CMD + ALT + E (macOS) or CTRL + ALT + E (Windows) to upload all artboards to Avocode. Figma: Press CMD + ALT + E (macOS) or CTRL + ALT + E (Windows) to upload all artboards to Avocode. 👉🏼 Tip: To exclude artboards from sync, add a dash or an underscore at the beginning of the Page or Artboard name. Artboards with same name will be synced as new versions - even if the artboard has been moved to a different Page. Since the 3.3 update you can even sync/import different design files as new versions of the file in Avocode - as long as the artboards are named the same. If there are more artboards with the same name, Avocode decides based on the artboard ID - the matching artboard is added as a new version and other artboards are added as new artboards (Version 1). Learn more about the versioning logic. Always make sure you have switched to the correct version (see below) before you click download. NOTE: Since the 3.7 update, you can also download Sketch design versions that were synced to Avocode via the plugin option: "Sync Selected Artboards." NOTE: Figma files cannot be downloaded from Avocode. Instead there is an option to "View in Figma" which opens the respective file in Figma. By default, you always see the latest version of the design file. 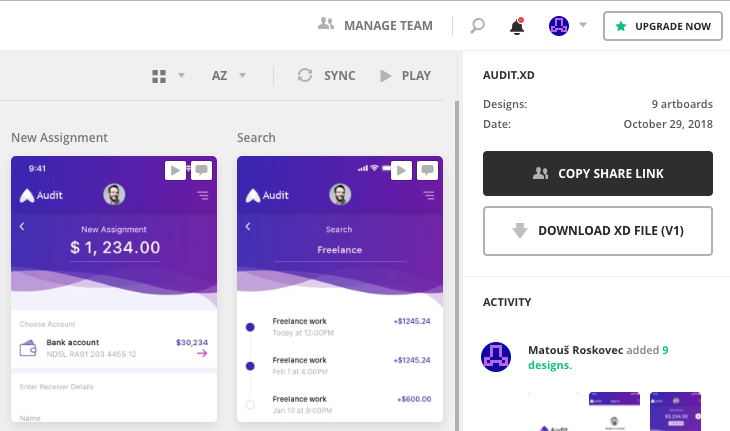 If you open a design and the switch to a different version and go back to the Project manager, Avocode will remember the version you were in. If you close the tab or go back to your project and open the design file again, you will again see the latest version. NOTE: You can switch between version states only in Sketch, Adobe XD, and Figma design files. Photoshop, PNG & JPEG files are always shown as the latest version and you can switch between their versions only in the Inspect mode and the Comment mode. ️This feature works only for files imported to Avocode 3.3 and higher. All versions of a Sketch, XD, and Figma files added to previous versions of Avocode will appear as merged into Version 1 in the Project manager. To access these older versions, please use the Inspect mode or Comment mode Version switcher/slider. Next to the name breadcrumbs click on the V1 button. You'll see a list of versions chronologically ordered from the bottom to the top, timestamp and name of the person who added the version. Click on any version in the list. NOTE: Versions are listed chronologically from the left to the right side. 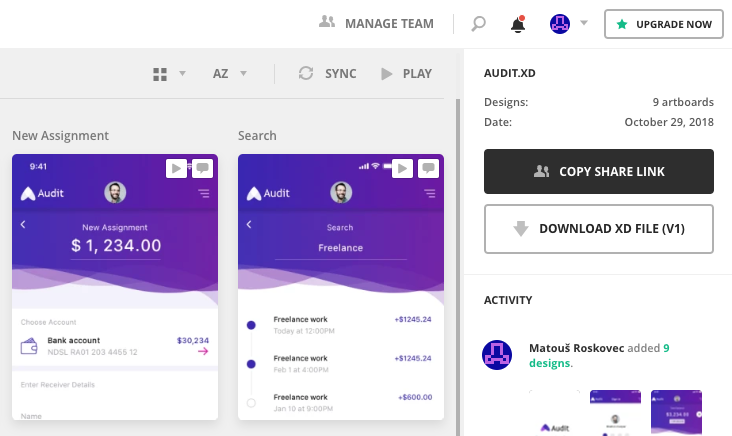 NOTE: If you share a design public link with anyone outside your team, they will be able to switch between design versions - even on mobile devices. In order to Comment they need to use the desktop browser or Avocode desktop app. In order to Inspect the design, they will have to request invitation to your team. 👉🏼 TIP: It's best to solve old Comments from previous versions so they don't appear on a new version (which could have a different layout and the Annotation dot would therefore appear elsewhere). If you open the previous version, you can see all the comments, that were solved on this particular version.